Walter Crane, a leading designer of the late 19th century, is now best remembered for his medievalising book illustrations. 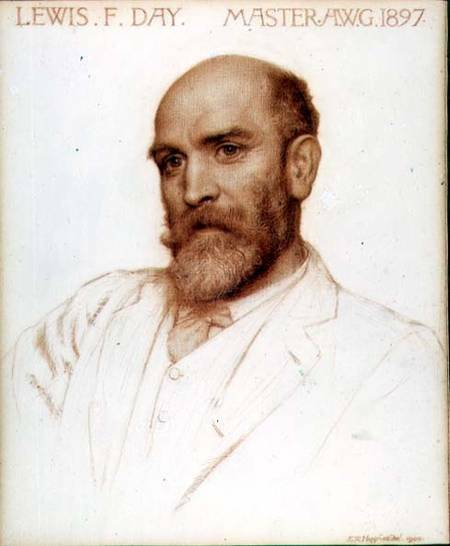 He was a major artist in the Arts and Crafts movement, the first president of the Arts and Crafts Exhibition Society, a friend of William Morris and a significant figure in art education. He had senior positions in Manchester and Reading art schools and was principal of the RCA, where he spearheaded major reforms. His friend Lewis Foreman Day is less well-known but was also a leading designer. He was a friend of Morris, an active member of the Arts and Crafts Exhibition Society and was master of the Art Workers Guild. He was an influential educator and was an advisor to government. He was commercially successful and dissented from some of the more idealistic Arts and Crafts theories. In particular, he thought it was wasteful and inefficient for a designer to execute all his own designs. The question of Designer vs. Executant dogged the Arts and Crafts movement, and although few Arts and Crafts artists made their own designs, doing so was held up as an ideal. Some years after Crane’s reforms of the RCA, (described in my post about the RCA’s pottery instructor, Richard Lunn) it became evident to government and industry that they had made little change to the relationship between artist and industry, and in 1910 the government set up a committee of inquiry to look into the problem. Day told the committee, against the growing orthodoxy of learning by doing, that the route the RCA was following, teaching design by direct working in materials, was mistaken and that there should be more emphasis on principles of design. Day and Crane had earlier published a friendly argument on a similar topic in Moot Points (1903). Crane comes over as an idealist who puts principle before profit, Day as a sensible businessman, nevertheless wedded to Arts and Crafts design principles. I was particularly interested in their discussion of the designer/executant issue (pp. 16-23). Day argues that it is neither necessary or desirable for the designer always to execute his own designs. His main objection is that, “Artists of imagination are not all patient workers, and able workmen are not all gifted with invention.” He agrees with Crane that the designer should be familiar with the material he is designing for, but he does not think that demands the designer to be the executant. There is an economic objection, but that is secondary to Day. His principal argument is that it is best for people to do what they are good at and that the good designer is not always a good maker. In practice the artist-craftsman is often less competent in his craft than the apprenticed craftsman – amateurism had already become a hazard of the Arts and Crafts movement. Crane insists that, on the contrary, most of the products of Arts and Crafts workshops are actually very good. To Day’s practical objection that it is inefficient and unprofitable for every designer to make his own designs, Crane falls back on utopian ideas. 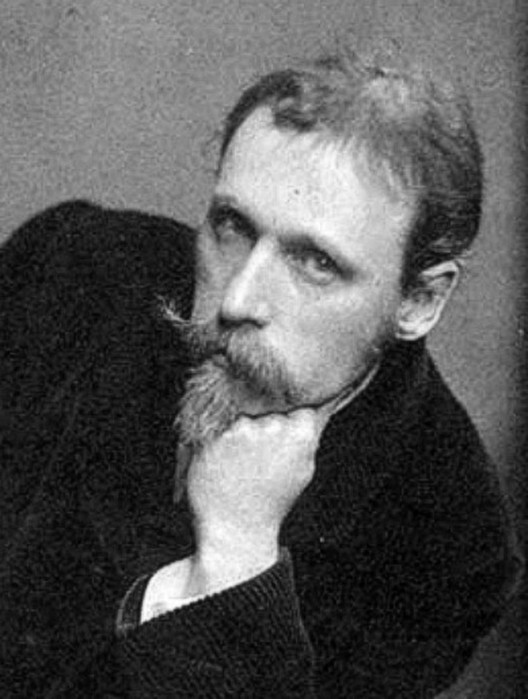 “That an artist could not maintain his standard of life if he executed all his own designs” says Crane, “is merely an indictment against present economic conditions.” The artists of the Arts and Crafts movement often blamed their financial difficulties on present economic conditions and believed that they would thrive when they were swept away and replaced. But with what? It was never explained how an artist could live under any system if he consumed more than he produced. The Arts and Crafts critique of present economic conditions inevitably led artist craftsmen – from C.R.Ashbee to Bernard Leach – to explicitly demand public subsidies. Here’s the chapter about whether an artist should make all his designs himself. L.F.D. The theory that every artist should carry out what he designs and every work man design what he does, will not hold water. To begin with, the thing is impossible. W.C. Softly, friend. Are you not attacking an ideal, a principle of work at least, which by its influence has already produced excellent results in our Arts and Crafts? Do you not as an artist desire to see designs well adapted to their material and executed with feeling? L.F.D. You don’t answer my direct challenge directly. Of course I want design to be adapted to its material and executed with feeling; but neither one nor the other depends upon designer and executant being one. I am attacking the delusive idea propounded in the name of Arts and Crafts that, to ensure on the one part adaptation and on the other feeling, design and execution must be the work of one man. W.C. When a man makes direct statements controverting a given position or opinion he must expect to be asked to support or prove them. The defender of the position attacked may choose his own method, I presume. I therefore ask you why you say ” delusive”? L.F.D. Because it tends to mislead. Artists of imagination are not all patient workers, and able workmen are not all gifted with invention. W.C. Do you think, then, that arty workmanship is of any value, from the artistic point of view, without imagination or feeling? L.F.D. It is because I want imagination and feeling and something more – craftsmanship (which I suppose you want too), and know that it is only by exception that I shall get all three from the same person, that I protest against the assertion that one man is to do everything. W.C. I never made the assertion you protest against, but I presume you would admit that a designer is all the better for a first hand acquaintance with the conditions, necessities and limitations of the work for which he is designing. L.F.D. Certainly; but it doesn’t follow in the least that he should execute his design with his own hand. W.C. How then would a designer obtain his first-hand acquaintance with a method or material unless he had actually worked out his own design in that method or material? L.F.D. he might often (not always) gain necessary knowledge by seeing others do the thing in the workshop. But I am not denying it is good for him (in some cases necessary) to do it himself and learn by actual experience what can be done. That is quite a different thing from doing all that he designs. W.C. He would never be able to pay his rent and taxes if he did so, under present conditions! But I take it you concede the principle of the thing. Obviously if a designer does not realise the conditions of his design and the nature of the method and material by which it is to be carried out, he cannot, practically, design at all. L.F.D. I began by saying it was impossible. You grant me that, when you allow that it would not enable a man to live. I do not concede that, even were it possible, it is desirable that design and execution should be the work always of one man. It is not merely your bogey, commercialism, which determines that one man should invent and another carry out – our faculties ordain it too. W.C. Not so. Besides, I did not say a man could not live if he always carried out his own designs, only that “he could not pay his (present) rates and taxes.” That is to say, he could not maintain the same standard of comfort or living as he could as a designer only, except perhaps in some special crafts such as bookbinding or jewellery or small decorative articles of luxury. There we are in economics, again! W.C. Seriously I do think that, without denying divergence of abilities, commercialism has been chiefly answerable for the separation of designer and craftsman. Our movement has been to re-unite them as far as possible – and, surely, so far all to the good. W.C. Well, for my part, I consider what has really had most influence in our modern revival of design and handicraft, in giving freshness of treatment in all sorts of ways, and infusing new life into thoroughly commercialised crafts, has been this very principle of the combination of designer and craftsman in the same person. Many artists might be named who have “found” themselves in this way of working. I go further and say it is the ideal way of working. L.F.D. Artists have of late, I admit, brought freshness of design into crafts that had got deep into trade ruts; but the more important “who might be named” do not execute with their own hands all they design. To do that may be the “ideal” way of working – it is not (when it comes to the crafts) the practical one. W.C. What would become of painting, for instance, if the execution were to be delegated to other hands than those of the man who conceived and designed the picture? L.F.D. A painter’s pride is in his painting; but a decorator or designer can, and may, entrust execution to assistants he has trained – must, indeed. Or would you waste the energy of a man of rare invention in doing what a workman of only ordinary qualifications can do quite well? W.C. The ideal way of working in the crafts is no doubt on the workshop system – a designer working with assistants, whom he trains and inspires, and from whom are developed fresh designers from time to time, who learn every detail of the craft. Some crafts depend more upon individual expression than others. Every designer should be able to discover the craft in which he can find himself the most. I was thinking more of the ultimate artistic expression in any method of work, though I do not think a man of invention, even, wastes his time in elementary or subsidiary work; it strengthens his grasp, and keeps him in sympathy with every stage. L.F.D. It is wasteful to set inventive brains to do work that wants only skilled hands – except in so far as it is well for a designer to do manual work enough to keep himself in touch with the workshop. W.C. You cannot separate brains from hands really. It is a favourite industrial device (or pretence), but it has nothing to do with art. In all forms of art one’s brains should be at the ends of the fingers, as well as in one’s head. I fear you must have got touched with a little industrial imperialism. L.F.D. Allowing assistants and executants at all, where would you stop? It must end in letting the men with fertile brains invent, and those with facile fingers execute. W.C. With a true workshop system one would not “stop” at all. There would be a continuous living tradition in design and workmanship; and invention is wanted both in design and workmanship. L.F.D. “Continuous living traditions” are just what are neglected by artists dabbling in crafts to which they have served no sort of apprenticeship. W.C. I did not speak of dabblers and I was upholding the old workshop system which includes apprenticeship. L.F.D. The relative separation of brains and hands is neither a device of industrialism nor a pretence, but the work of nature. W.C. The actual separation of brains and hands in modern manufacture, accompanied with the ideal of mechanical and “trade finish,” has been the chief cause of the decline of art in industry. The revival has been owing to artists. L.F.D. We are born with gifts of one kind or another. It is very rarely that a man is doubly gifted; and it is of no use arguing as if one great faculty did not practically imply some lack of capability in the opposite direction. L.F.D. The protest against “trade finish” goes too far when it is content with the unfinish of artists playing at craftsmanship. Your last remark falls flat. I said “relative” separation of brains and hands. W.C. You misunderstand my remark; I was merely asserting the fact (in contradistinction to your relative separation) that the actual separation of brains and hands in modern industry had brought about the death of art. (That is flat, but I don’t see it falls flat!) Who do you mean is so content with amateur work while protesting against trade finish? The charge is unfair. Morris was an emphatic protester: was his work unfinished? One of the most remarkable results of the movement has been the development of competent artist-craftsmen. Commerce is quick enough to imitate, anyway. L.F.D. I don’t mean Morris, of course – men of genius may do what they like – but artists (and they are not a few) who exhibit craftsmanship which gives the workman good reason to scoff. My contention is that in the “artist-craftsman” work, of which we hear so much, the craftsmanship is (naturally) very often less than competent. W.C. I was not considering inefficient workmanship at all. You might condemn any movement by taking its lowest standards and results, perhaps. The fact remains that the Arts and Crafts movement has produced competent craftsmen in various crafts who are at the same time artists, and has also infused new life and feeling into the decorative arts generally. I do not understand why, if you are in sympathy with the aims and ideals of a movement, you should try to undervalue its work. L.F.D. I am not trying to undervalue anything, but to rate things at their worth. Much of artist-craftsmanship, so called, is inefficient. And the delusion that there should be no sub-division of labour goes to account for its inefficiency. W.C. One would think from your words, however, that you hated an artist-craftsman and all his works! L.F.D. I have no prejudice against the artist-craftsman as such. I do resent his bounce; but I respect his modest effort, and admire his real accomplishment. W.C. I am not aware of any faddist who goes so far as to say there should be no sub-division of labour. I have already put forward the workshop as the true system, where craftsmen and designers can learn every process and condition of a handicraft, and where also there is helpful co-operation and mutual assistance in carrying out a work, and where men may differentiate. Our technical schools now to some extent endeavour to fill the place of the old workshop in the handicrafts; but schools are apt to be theoretic at the best. Very few men like anything new, and trades are very conservative. But we have had to upset bad trade traditions. As to the scoffer, he generally makes a mock for jealousy. But, after all, the trade journals write much more sympathetically about the Arts and Crafts than the literary critics, who, of course, are eminent craftsmen (!) and know everything. L.F.D. What have technical education, trade journals, and literary critics to do with it? W.C. As our technical schools are educating students to execute their own designs in various materials, and as at the outset you declared it impossible for a designer to be his own executant, I think this reference of mine does bear on the question. L.F.D. Your point of view wants making clear. You admit the impossibility of a man’s paying his way by executing his own designs, and you allow some sub-division of labour. And yet you take up my challenge. Where, precisely, is it that you join issue? W.C. That an artist could not maintain his standard of life if he executed all his own designs, is merely an indictment against present economic conditions. Much depends upon the kind of craft, too. In some crafts, it seems essential that designer and crafts man should be one: such as painting and modelling, calligraphy and illumination, book binding, jewellery, enamelling. Others, which involve multiple and perhaps heavy labour, may be co-operative, rightly. So far as artists have become craftsmen I think it has been all to the good. L.F.D. I did not say it was impossible for a designer to be his own executant – in some crafts it is very possible. What I am combating is the theory that, where he is not, he ought to be. W.C. Surely it entirely depends upon what sort of a designer he is? L.F.D. That it all hangs upon the sort of design is just my contention. W.C. We are agreed, then, that it depends upon the sort of design how far it is essential that design and execution should be in the same hands? L.F.D. You grant me all I ask.